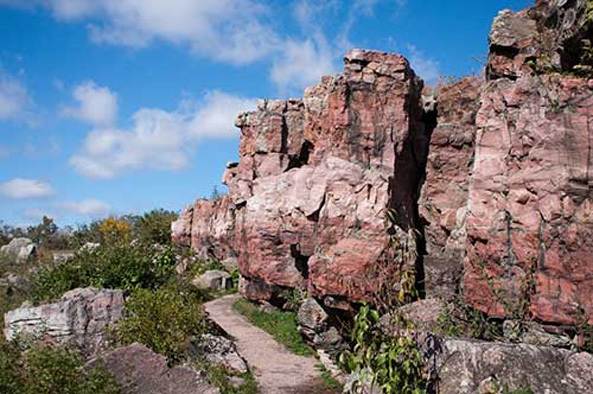 For centuries, tribes have gathered at the pipestone quarry to obtain the smooth rock they use to make pipes. The area was a neutral zone, where different groups came together in peace. It was said that if you approached the quarry and a light rain fell, this was a sign that you were permitted to enter. By the 1700s, native trade was so extensive that the distinctive red pipe bowls were found throughout large parts of North America. Several legends tell of the origin of the distinctive red color. In Dakota Sioux tradition, the Great Spirit sent a flood to cleanse the earth, and the red pipestone (inya sa) that remains is the blood of the ancestors. As related by the explorer and artist George Catlin, the Great Spirit declared that the “…red stone was their flesh, that they were made from it, that they must all smoke to him through it, that they must use it for nothing but pipes–and as it belonged to all tribes, the ground was sacred, and no weapons must be used or brought upon it.” Another legend attributes the red color to blood from a fierce battle. When the last two chiefs killed each other, the people would have been extinct, save for three young women who hid behind huge rocks. These rocks are in a valley near the quarry and are known as the Three Maidens. Although the land around the Pipestone Quarry had been acquired by the United States in the Louisiana Purchase of 1803, the eastern Sioux tribes were firmly established there and they controlled access to the quarries. Westward expansion and subsequent land ownership by the multitudes of whites who were settling in Minnesota resulted in two treaties that significantly impacted control over the pipestone quarries. The 1858 Treaty of Washington DC promised to keep the quarry open to Yankton “so long as they shall desire” but they had to give up 11 million acres in return for a reservation of 430,000 acres and some land surrounding the quarry. In their continuing effort to suppress and weaken native religions, missionaries convinced the government to exclude the Three Maidens from this tract of land. In spite of the treaty, the 1870s saw a series of encroachments by white settlers. Though the Yankton’s rights were affirmed in the beginning, enforcement was lax due to legal battles and administrative delays. The Yankton were outraged when, in 1890 and 1891, plans were unveiled to build a railroad and an Indian school for other tribes on the quarry land. In the legislative history introducing the 1978 American Indian Religious Freedom Act, the congressional task force acknowledged that the government had deliberately planned the railroad construction to run through the sacred ledges which created the waterfalls of the quarry in order to “erase all traces of their former outlines and to render them useless for ceremonial purposes.” During this period, the government argued that the land did not belong to the Yankton, but to the government, which had reserved quarry use for the Yankton by treaty. Meanwhile individual citizens wanted the land for recreational and agricultural uses. The Yankton’s challenge to these projects resulted in an 1891 opinion letter on the status of the reservation lands by the U.S. Attorney General. The Attorney General acknowledged only that the Yankton had been granted quarrying rights at Pipestone, and he found that their protests against the school and other development were not legitimate. It was under this cloud of uncertainty that the Yankton negotiated an agreement with the Secretary of the Interior under which they gave up all rights and interest in the Pipestone Reservation, retaining permission to camp and quarry on a 40-acre tract of their choosing, in exchange for $100,000 (plus 6% interest for previous encroachments) to be paid in cattle and cash. The United States agreed to maintain the area as a national park. Ratification of this agreement was stalled because the question of whether or not the Yankton owned the quarry had not been resolved. In 1925, the Court of Claims upheld the Government’s contention that no compensation was due the Yankton since they never held title to the land. Then, the Supreme Court established that the Yankton did own the land and they ordered the Court of Claims to set its value. The Deficiency Appropriation Act of March 4, 1929, provided payment of $328,558.90, which resulted in the members of the tribe receiving $151.99 per person. This sale cleared the way for the establishment of Pipestone National Monument in 1937. The government agreed to protect the area and allow the Yankton to use the quarry. While non-Indians are barred from quarrying at Pipestone, there are still disagreements about who has the right to quarry and sell pipes. The Yankton Sioux, a federally-recognized tribe in South Dakota, feel that quarrying should be limited to specific ceremonial use and that pipes should not be sold under any circumstances. They are joined in this sentiment by Lakota elders and the National Congress of American Indians. The Pipestone Native American community, an unrecognized group mostly descended from Dakota bands, has been living around Pipestone and quarrying for generations. They argue that the Yankton do not have the exclusive right to determine the protocol for use of the quarry, and that selling pipes is an acceptable contemporary variation on past customs of bartering. The years 1987-1994 saw a major campaign by the Yankton Sioux asking the Pipestone community to “immediately vacate the Red Sacred Pipestone quarries.” The Yankton organized ceremonial runs and a Keepers of the Treasures convention to discuss the issue, raise awareness, and attract national attention. The other major issue at Pipestone is its status as a National Monument and consequently a tourist destination. Access to the Three Maidens is a major concern among the Sioux. The National Park Service commissioned several ethnographic studies in the 1990s to study the impact of non-native visitors on native spiritual practices. Among their recommendations to the NPS were: more privacy for ceremonies and sweat lodges, advising visitors not to disturb offerings, and providing more education to visitors. As is true with the Black Hills, treaty rights have been seriously violated at Pipestone. In both cases, the native people insisted that control over the respective sacred areas be recognized by written treaties; however, when the U.S. government decided it wanted the land, legislation was passed to take it. At the time, the only recourse against invasions like the railroad was for Pipestone to become a National Monument. However, being part of the National Park Service has brought other problems, including public demand for open use of the land.